We saw the Samsung Galaxy A8 (2016) making rounds on benchmarking websites like GFXBench and Geekbench in July and August respectively. While that gave us a fair idea of the kind of hardware to expect from this device, we were still unaware of how the device looked. 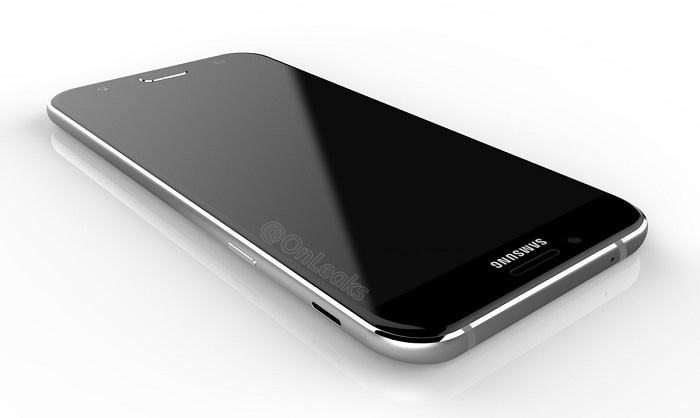 However, thanks to the renders leaked online, we now know how the device will look like. 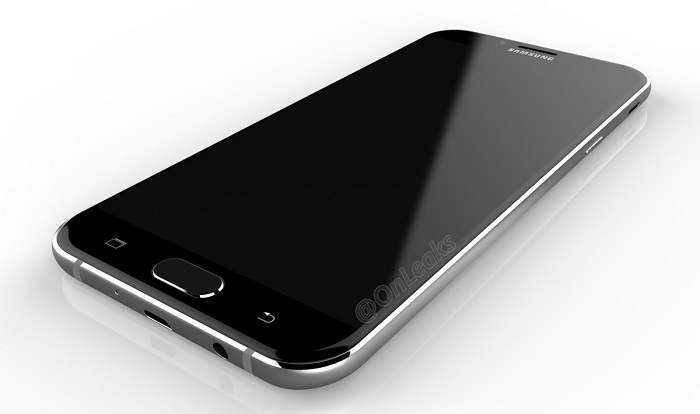 The renders leaked show off a black Galaxy A8 (2016). After having a look at the renders, we can say that the device seems to have glass on the front and the back, giving it a glossy look. The device has dimensions 156.5 x 77.5 x 7.3 mm which makes it larger than the Galaxy S7. At the front, there’s the usual Samsung logo above the display along with earpiece, front camera, ambient and proximity sensors. Below the display is the physical home button which seems to house a fingerprint scanner as well. The home button is flanked by the recent and back key. 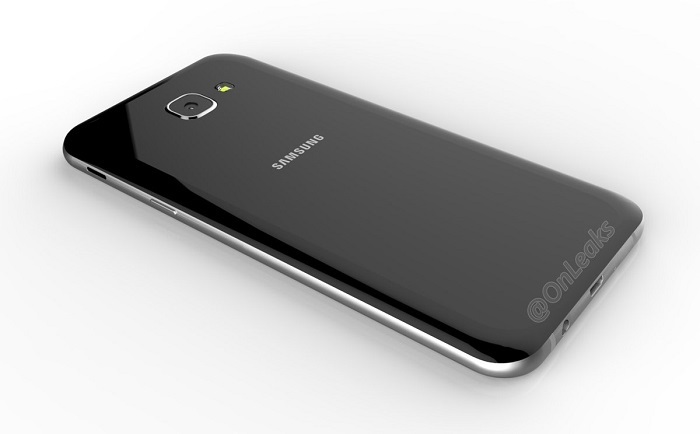 On the back, there’s a primary camera which is accompanied by LED flash to its right and Samsung logo below it. To the left of the device is the volume rocker along with SIM card (and hopefully microSD card) slot. At the right, you will find the power button along with what is said to be a “relocated speaker”. The reason for saying so is that we can’t see the speaker at the bottom as there’s only microUSB port and 3.5 mm headphone jack. Talking about the specs, going by the listing on benchmarking websites, the Galaxy A8 (2016) will have Exynos 7420 SoC under the hood paired with 3 GB RAM and Mali-T760 MP8 GPU. 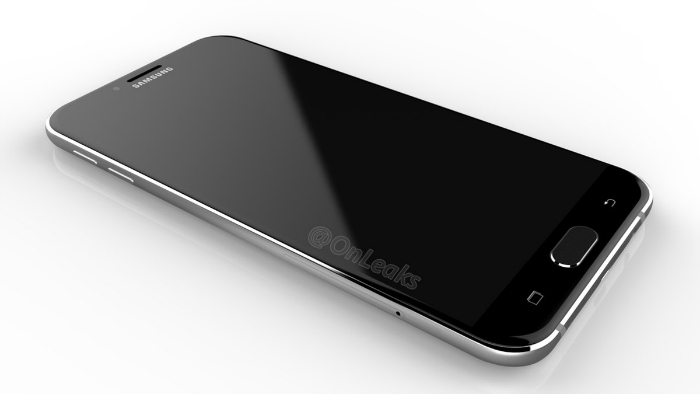 It will have a 5.1-inch (or 5.7-inch, going by dimensions) display with a Full-HD resolution. There will be 32 GB of internal storage on board along with a 16 MP rear camera and a 5 MP front camera. As of now, there’s no information as to when the device will be unveiled.